It may well feel like an eternity since 1979, when Pearson launched Pearson Dance Company in New York City. By the time he came to UCSB in 1990, he was already a seasoned choreographer and director, and the next year he took the helm of the university’s modern dance company in residence, then known as Repertory West. Flash forward two decades, and Pearson is still setting new choreography on his dancers each year, rehearsing, and producing touring shows. The time has finally come, he says, to see what else the future might hold. Pearson’s sabbatical just happens to coincide with SBDT’s 20th anniversary, so before the company takes a year off, they’re giving a retrospective show, and they’re going big by booking the Granada for one night only: Friday, January 14. Though they’ve performed in even larger venues when touring Asia, at home, SBDT typically presents work at UCSB’s 340-seat Hatlen Theatre, which is currently under construction. At over 1,500, the Granada is quite a leap. “It’s a big celebration, so we figured we might as well just do it,” Pearson explained. The program they’ll be presenting spans from SBDT’s early days to work from 2010, and it includes pieces from the active repertory as well as those that have not been seen in 15 years. Pulling together a retrospective on this scale has given the director a chance to reflect on his career and also to arrange a reunion of his dancers. In addition to the current core company, Pearson has invited a number of ex-SBDT dancers home for this show. Many have responded to the call, flying in from New York, Arizona, and Northern California to rehearse. Other past company members will come to town simply to see the show and join the celebration. Though SBDT rehearsals and performances have taken place primarily on the UCSB campus, the company has also made its presence known in the larger community over the years, primarily through shows at the Lobero Theatre. It remains the only professional modern dance company in Santa Barbara that has consistently employed a full company of dancers each season. Those who have tracked Pearson’s artistic development have noted his growing interest in the intersection of dance and technology; today he uses elaborate multimedia effects in his work and also teaches digital choreography to UCSB undergrads. He cites his years as a performer with Nikolais Dance Theater as having sparked this interest; Alwin Nikolais is known for having created striking dance spectacles using dramatic projections, light effects, and costuming. From the beginning of his career, Pearson experimented with slides to push the boundaries of what he calls “the kinetics of images.” By 1999, when he choreographed one of his signature works, “Strange Boat,” he was using video projectors to make images and words float across the scrim behind the dancers. “Strange Boat” will appear on the program January 14 along with other dances Pearson feels represent high points in his artistic trajectory, from “Hambone for 2,” choreographed in 1979 and performed here by McCarthy and Pearson, to “Voice, Finding My” from 2009, in which the dancers speak, sharing autobiographical information that also appears as projected text. As Pearson prepares to sail into uncharted waters, the company he has directed for 20 years faces an equally uncertain future. Though Pearson’s not quite ready to retire, he plans to step back from directing SBDT even after his return to the department in 2012. It’s not yet clear who might step in to lead the company. That UCSB has maintained a professional modern dance company in residence for this long is an anomaly—no other UC school and few other universities nationwide can boast such a company. That’s due in part to the funding by generous private donors, and in part to Pearson’s unusual dual role as department head and company director. 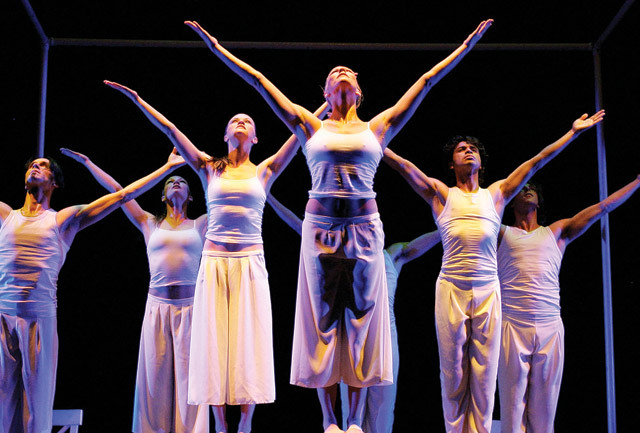 Santa Barbara Dance Theatre will perform at the Granada Theatre on Friday, January 14, at 8 p.m. For tickets and more information, call 893-7221 or visit www.theaterdance.ucsb.edu. 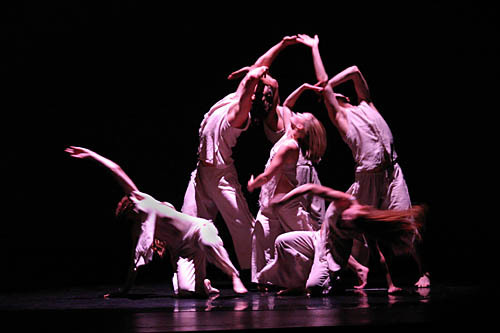 For more on the company, call 893-4527 or visit santabarbaradancetheatre.com.